: Add . Place a charge counter on ~. Rather than have this enter tapped, I wanted to make a land that was usable on the turn it was played without restriction, but lacked its full potential that turn. 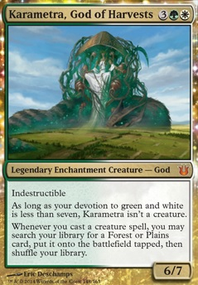 This is not designed to be a great land, but rather something that would be serviceable colour fixing in the generally slower games of limited. 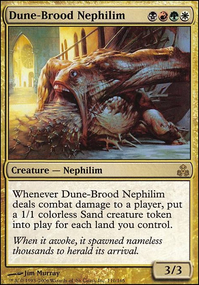 I like the general design of this, but I think it would be better if the land entered tapped unless you tapped a creature. Here, you've made a generally better shock land, and I think that's rather problematic. I also would say it should be either a snow land or have two basic land types; not both. MontaukMonster's "choose land" - I like the theory behind this, but think it is impractical to implement. It's not quite the same case as Cavern of Souls , where your choice is likely to be the same for each Cavern, so you'll have to keep track of multiple different lands with the same names, but different effects. dbpunk's "does not share a land type land" - I'm a fan of this one. It's a good turn 2 or 3 land, but is generally going to be slow mana on turns 1 and 4+. dbpunk's "pay land" - this is far too good. The turn it is dropped, it is a pseudo filter land; each subsequent turn it puts you a full mana ahead. 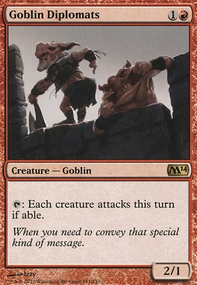 Even on turn 1, this is powerful; you can generally survive missing a 1 drop, and this will put you at 3 mana on turn 2. Yikes. Funkydiscogod's "spend only on the other colour's spell land" - I'm a big fan of this one as well. It's fun, it's interesting. It would work wonderfully in a Ravnica-like set with lots of multicoloured cards. 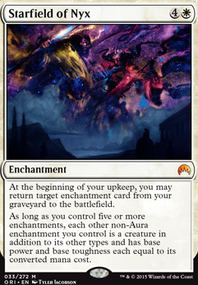 Boza's "exile 2 land cards from graveyard" - this is another good one, having good synergy with fetch lands. 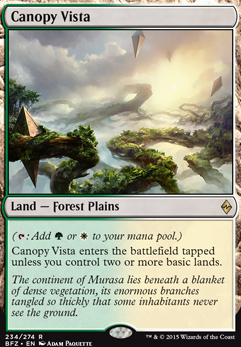 Boza's "opponent has more lands land" - another good option, sort of like a reverse Canopy Vista . Flooremoji's "doesn't untap unless exile card from graveyard" - another good one, though I might suggest removing the land types. Otherwise, you can turn 1 fetch and use, turn 2 exile the fetch to untap. That might have been the intent, but I think it diminishes the design some. for five color decks with weaker land bases (i.e. 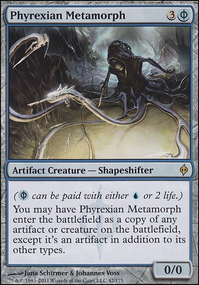 no fetches for color fixing and limited dual type lands) you gotta make up for it with ramp spells, no way out of it unless your RNG is amazing and you put some work into the math of your color cost curve. the bfz lands are pretty cheap like Canopy Vista , or you can go for the spell route to color fix, one of my favorite is Shard Convergence tho it is a bit slower. Also Tempt with Discovery ? 4 CMC is where your curve actually ends so you don't need that much ramp, especially when your 2 CMC ramp package is alright. If you can afford Breeding Pool and Canopy Vista you can easily set yourself up with Nature's Lore . For another 2 CMC ramp swap - Gatecreeper Vine is not that great, you're waaay better off with Sylvan Caryatid , you won't belive how many times it's hexproof screwed my opponents tring to remove it. Another little swap - Tower Defense is way cheaper than Solidarity . But if you want to swap it or use both its up to you. Maybe I'd cut Slagwurm Armor for another copy of this effect because artifact is easy to remove compared to instant speed combat trick. As you lower the curve maybe you won't need signets. 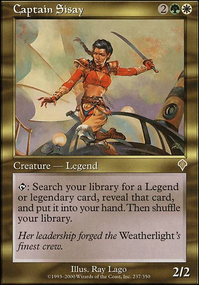 Also I see you lack some interaction in form of counterspells but I guess your playgroup isn't that removal heavy.